On vacation in Maine in 2013, film actor Christian Slater happened upon an orphaned eider duckling and, playing the part of the good Samaritan, brought it to the Center for Wildlife in York. There, Kristen Lamb, the center’s director, recruited the Hollywood star to help find the orphan a new mom. 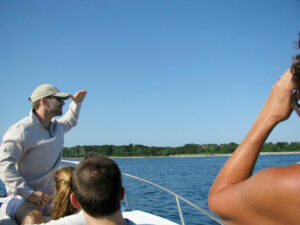 He joined the wildlife rehabilitators in their boat off the coast of Kittery to search for an eider hen with ducklings. When they spotted one, Slater released the foundling and watched as the eider mom retrieved the peeping baby. Another successful animal adoption in the wilds of Maine. While biologists consider natural adoption in the animal kingdom very rare, some wildlife species do the equivalent of leaving a baby in a basket at a stranger’s home. These species, called “brood parasites,” rely on another species to raise their young. The most well-known brood parasite is the brown-headed cowbird, which is native to Maine. This gregarious bird conducts a very clever – and very successful – dump and dash during the breeding season, leaving its own eggs in the nests of other bird moms. Most other bird species will accept cowbird eggs, said Noah Perlut, an environmental professor at the University of New England. He said hundreds of bird species have been documented doing so. Leave them where you find them! When you find an orphaned wild animal in Maine, the best first step is to call a wildlife rehabilitation center or the Maine Warden Service. They can assess if a rescue is needed at all, and next, help you execute it (or tell you to keep your distance and wait for the experts). While this may have been Maine’s most glamorous wildlife adoption, the situation itself is not unusual. Except in very rare instances, though, such adoptions are forged by humans. “I’ve only seen it (occur naturally) once, and I’ve seen literally hundreds of litters,” state biologist Randy Cross said about his own area of expertise – black bears. Young animals can become orphaned when they are fleeing a predator, a parent is struck by a car or killed by another animal, or a nest or den is disturbed and the parents flee. But with a little human cunning, some species can be persuaded to care for offspring not their own. 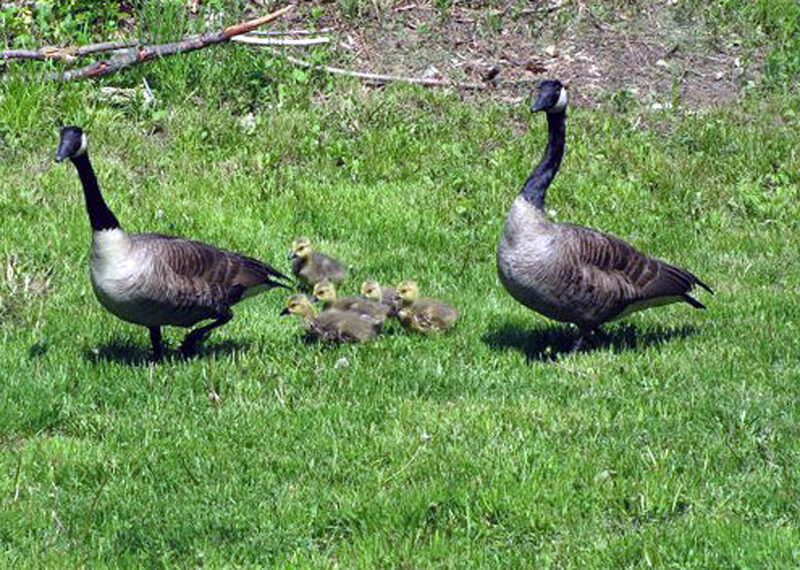 Wildlife rehabilitators in Maine often add a duckling or gosling to the broods of wild ducks and geese. And each spring, when black bears emerge from their dens, a few mother bears find an extra unrelated cub or two comingled with their own. 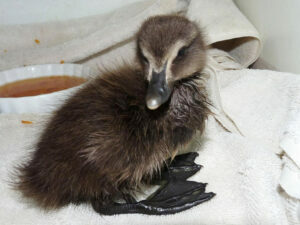 At the Center for Wildlife in York, Lamb helps facilitate eider duckling and Canada gosling adoptions every few years. She’s done it so often, she has her technique of releasing babies back into the wild down pat. Lamb said with common eiders and Canada geese, the adults seem to regard any nearby duckling or gosling as one of their own. With eider ducks, the hens protect and raise the ducklings; with Canada geese, both male and female geese watch over the goslings. Lamb expedited one memorable adoption with a pair of Canada geese in her backyard last summer. After spending several days in her kayak scouring a beaver pond for suitable adoptive parents for an orphaned gosling she was caring for, one day two adult geese with goslings wandered into Lamb’s backyard. Lamb seized the moment. She ran and got the orphaned gosling and used her hanging laundry sheets as a bird blind. Other water birds, such as wood ducks and teals, are too skittish to make this covert operation possible, Lamb said. But when the state finishes its current inventory of bird nesting sites, she hopes to try adoptions with other species, such as bluebirds. Black bear are the most common mammal to be used as adoptive parents, and state biologists in Maine have orchestrated such blended families for more than 40 years. The state’s 44-year radio-collar study, which tracks female adult bears, helps them to do so. Also, after sows give birth in early January, they slumber through the cubs’ first three to four months of life, and when they wake up, they don’t seem to notice an extra baby or two. In his 37 years with the Maine Department of Inland Fisheries and Wildlife, Cross has handled close to 90 orphaned cubs, adopting out from one to three at a time. Biologists never place more than a few extra cubs with a sow, as they want to be sure she can rear her litter successfully. Female black bear produce a litter of up to five cubs every two years. Bears recognize their cubs by smell. So biologists “disable” the sleeping mother’s sense of smell by rubbing Vicks VapoRub on her nose. When a cub is dropped near the den entrance, the sow will hear it cry and instinctively pull it into the den and under her. Cross said past experience has shown that the new cub soon smells like its step-siblings, so the mother bear doesn’t reject it. Biologists know this because they check the 85 dens with radio-collared sows every year. For the last 20 years, four specific radio-collared sows have been tasked with the job of “foster mom.” The biologists use this foursome because they are outside the radio-collar study area, so the data from their partially adopted litters – the result of human interference – won’t taint study results. Since black bears can reproduce until age 25, those four moms may raise many foster cubs. 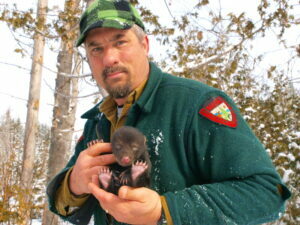 Biologists orchestrating adoptions of orphaned bear cubs is a common practice in other states. But Cross knows of only one time an adoption by a black bear occurred naturally in the wild. In 2009, Cross visited the den of a radio-collared bear that had three cubs. In 2010, when he returned to the den, the sow suddenly had four yearling bears. Somewhere in the litter’s first year, the sow picked up an extra cub, and it wasn’t the work of biologists. Maine biologists keep meticulous records of the dens they visit each winter, and Cross said the fourth cub did not look like the original three. “It came from another mother and somehow they got mixed up, but we don’t know who the other (mother) bear was,” Cross said. Such natural adoptions have been recorded in only a few instances in other species. State bird biologist Kelsey Sullivan said common eiders sometimes adopt a duckling or two, but more often, a kind of “babysitting” takes place, where eider hens watch over ducklings that aren’t her own. These incidents, called “misdirected parenting,” are very rare, said Noah Perlut, an associate professor of environmental studies at the University of New England. Perlut said the example of natural adoption among common eiders likely is caused by the overwhelming drive within the species to reproduce successfully and prevail over predators.